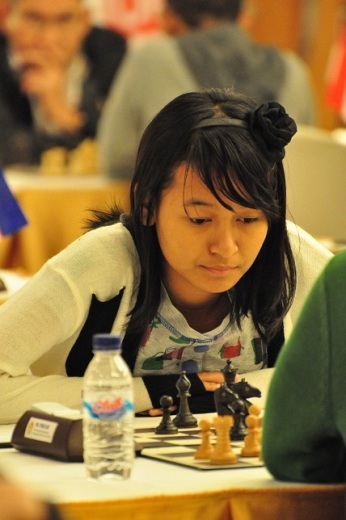 Peter Long on Chess: Medina Warda Aulia is Indonesia's Youngest WGM! Medina Warda Aulia is Indonesia's Youngest WGM! Medina Warda Aulia is Indonesia's youngest ever Women Grandmaster, achieving her third and final norm at the ongoing World Junior Championship. Last time around she almost won the championship, ultimately finishing fourth on tie-break and in fact was the leader in Turkey after six rounds till back to back losses pushed her back and essentially end her challenge. But Medina has shown great strength of character to bounce right back to make the WGM title with one round to go! I remember first seeing her as a 10 year old winning the World School Championship in Singapore and was privileged to be present as Chief Arbiter to watch her demolish the entire French team and carry her country to victory at the MAKITA Indonesia-France Match last year! At that time the Indonesia coach, a former Georgian super GM, told me that she was now clearly the best woman player in her country. Yes Medina is a super talent with the only reservation being she is growing up and sometimes that makes for inconsistency but when it comes together (as is starting to become the norm more and more often) her play is a a real pleasure to watch indeed. Congratulations Medina! I look forward to seeing you at the Indonesian Open next month!